A president’s state of the nation address (SONA) is supposed to be a report of the accomplishments of the administration and an articulation of its priorities and policy direction. There were presidents who even used people as symbolisms such as Mang Pando of the Ramos administration and the bangkang papel children of the Macapagal-Arroyo administration. Well, nothing improved in the lives of Mang Pando and the children, much less the poor who they represented. The annual state of the nation addresses of President Duterte’s successor Benigno Aquino III, who appeared to be always on the defensive mode, were always about the sins of his predecessor Gloria Macapagal-Arroyo and boasts about his administration’s accomplishments, which were so far from reality. For President Duterte, nobody was expecting gimmickry. They were expecting cuss words, profanities, and ad-libs. 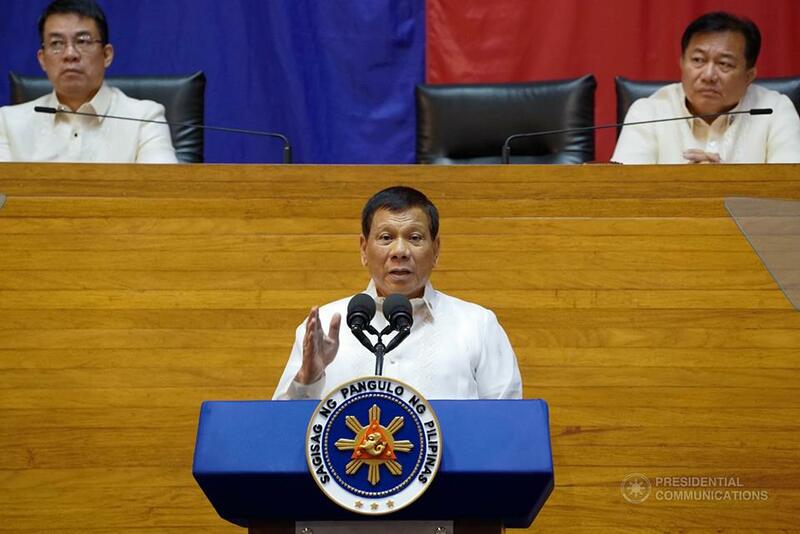 President Duterte was his usual self, perfunctorily reading the prepared speech – except in the beginning when it dealt with his administration’s bloody war on drugs – and deviating from it to talk about what he thinks. The 15-page speech, which was supposed to last for one and a half hours, went on for more than two hours. While President Duterte talked about the need for change, clearly his main point is that peace and order is the key to development. He also did a tirade on irresponsible mining. He mentioned tax reform, infrastructure development, the problem of traffic, right sizing the bureaucracy, an independent foreign policy, among others, but all these were part of the prepared speech, which, we assume, are the plans of his Cabinet. As for President Duterte, he spent majority of his time in the podium justifying his bloody campaign against illegal drugs and criminality and the declaration of martial law in Mindanao. He even taunted the National Democratic Front of the Philippines and declared his policy not to engage in peace talks anymore. So from the beginning, middle, up to the concluding part of his speech, he has interspersed his state of the nation address with profanities against critics of his administration’s human rights record and justifications on his bloody peace and order campaign. However, a peace and order campaign that does not address the problems keeping the country in a state of backwardness and underdevelopment would not lead to progress and development; it would result in a far worse state of underdevelopment and dependence. A peace and order campaign that does not address the roots of social injustices would not result in inclusion, social justice and prosperity for the poor majority, but would rather result in greater social inequities and worsening poverty. A peace and order campaign premised mainly on the need for an iron hand and violence would not result in just peace, but in an intensifying state of violence, social unrest and conflict. Independent think tank Ibon Foundation concluded that looking at and trying to solve the country’s economic problems through a peace and order campaign is overly simplistic. Looking at and addressing the country’s political and social problems through a peace and order campaign is not only simplistic; it bodes of a far worse situation than what we have now. Let us not forget the ills that Martial Law, which was imposed by the Marcos dictatorship, brought to this country.